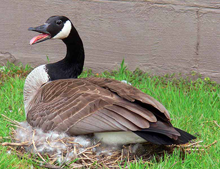 A Canada Goose (branta canadensis) on the nest, engaged in a threat display. Possibly she regards the photographer as having approached a little too close. Animals engage in threat displays for many reasons, but in cases such as this, it's to make themselves seem more powerful, so as to warn their targets to back off. Because the animal feels threatened and fearful, it tries to communicate its power to harm the target. In other words, it projects power because it feels it might be at a disadvantage. Humans who behave as if they have "big egos" might be doing something similar. Photo courtesy U.S. Fermi National Accelerator Laboratory Office of Science. Sometimes we notice behavior that leads us to believe that the behaver has a "big ego." What do we mean by this? A big ego is something that afflicts many people other than us. Usually, we're referring to behavior that we believe overvalues the behaver relative to others, often to an extreme extent. Some typical examples: always sitting in the power seat in the room, demanding control of the agenda, insisting on a specific time or place for a meeting, or dismissing the contributions of others in unnecessarily insulting ways. The behaviors we identify as demonstrating ego bigness are essentially assertions of relative status. The behavers are doing things that express the idea that their own status — social, financial, intellectual, etc. — exceeds the status of others. But even in terms of the metaphor, we might be getting it wrong, as is often the case with metaphors. When people behave in the big-ego mode, they might actually be expressing a "tiny ego" perspective. That is, the need to assert superior status so exuberantly might actually result from a sense of low status — in metaphorical terms, tiny ego. of relative statusmight not be trying to express their superior status. Instead, they might be seeking shelter from their own perceived inferior status by adjusting their own view of how others see them. When we observe big-ego behavior from this perspective, strangely, it's much less irksome. Instead of experiencing offense or anger, we can experience sympathy or pity. Instead of teetering on the edge of "losing it" we can find a sense of peacefulness and calm. This kind of confusion — misreading tiny-ego behavior as big-ego behavior — occurs elsewhere, too. It's a result of the ambiguity of the outward manifestations of feelings, or affect. That is, when we try to interpret someone's affect, we sometimes draw incorrect conclusions. We confuse, for example, cold aloofness with temerity or shyness. Aloofness and shyness are quite distinct, but the behaviors associated with them are less so. And interpreting behavior is one place where we go so wrong so often. Would you like to see your comments posted here? rbrenvxonaPeRYkZQhZXoner@ChacjWsYePwykEUzLJLhoCanyon.comSend me your comments by email, or by Web form. I offer email and telephone coaching at both corporate and individual rates. Contact Rick for details at rbrenAgxoczPtvHdpGYQyner@ChacTVNfAOrLihzHGZTboCanyon.com or (650) 787-6475, or toll-free in the continental US at (866) 378-5470.